The bestselling Little Golden Book all about robots! 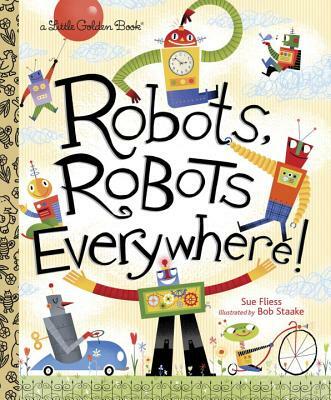 Robots are everywhere in this bright and funny board book – and preschoolers are going to love it! Whether up in space, beneath the seas, or even under couches, award-winning illustrator Bob Staake’s bold and colorful bots make this book a must have. SUE FLIESS is the author of numerous children's books for various publishers. She’s also a freelance writer and a copywriter for a high-tech company, and lives in the San Francisco Bay Area with her husband, two sons, and a rescued Lab named Teddy. Her next Little Golden Book, How to Be a Pirate, will be published in Spring 2014. BOB STAAKE has illustrated many popular titles for Golden Books, including We Planted a Tree; I'm a Truck; and I'm a Monster Truck. He wrote and illustrated the Golden titles The Red Lemon, a New York Times Best Illustrated Children's Book of the Year, and The Donut Chef, a Children's Choice Book Award finalist.